I visited a friend of mine, and he happened to rent a DVD with 2000 made-for-TV "Jason and the Argonauts" film (his son is into ancient Greek myths). Anyway, the movie itself is nothing to talk about, but I was somewhat surprised by the depiction of argonauts' armor and weapons. I am by no means an expert on ancient Greeks, but most of it seemed surprisingly accurate, at least to me - more than what I usually see on TV. This was especially noticeable in contrast with film itself being rather cheesy (in my opinion, anyway). - Most helmets did not have crests on them. I think I only saw 2 helmets with crests, one was on the king who killed Jason's father (this crest was set across the helmet, like the one on the statue of a spartan officer). Another one looked somewhat odd, it was tall and not wide (like capital U turned upside down) and it looked like it was made of same metal as helmet. The rest of helmets were unadorned, mostly Corinthian but some open-faced (almost a scull cap). They were not shiny either, and did look like bronze or copper. 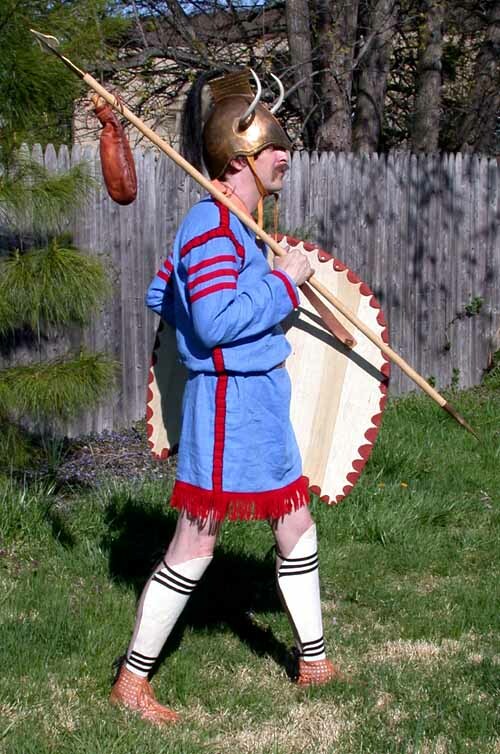 It looked, to me, fairly close to what typical greek warriors would wear (maybe in a different time). - The shields looked just the right size, covering roughly from top of the neck to top of thigh. In most other movies I've seen the shields were a bit too small. - The spears were also just the right size, not the long ones you see in many movies, but about a foot or two above soldier's head. This I think is how they are often depicted on Greek vases. - The swords looked right (leaf shaped straight swords and, at least in one scene, a kopis). In a scene where they flee from garpias, one can see the swords hanging from their left back side, below the armpit - is this how they were usually worn ? All in all I thought it was better researched than most other "ancient" films, esp. from 50s - 60s. (BTW, the weapons looked alright only so far as the greeks are concerned, once they got to Kolchida (sp?) all bets were off and there were some weird-looking fantasy helmets). Anyway, I was wondering if somebody else could comment on historical accuracy of weapons in this movie. All the bronze should shine, and probably most of the wood and leather would have been brightly painted. Hollywood has this bizarre obsession with black/gray/brown armor, one of my all-time pet peeves. Crests were common, made of black or white horsehair, though Homer mentions purple crests a couple times. 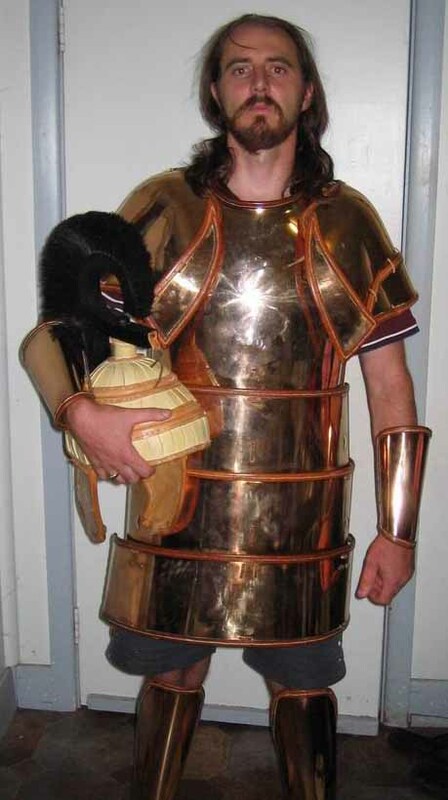 Corinthian helmets and other items from the Archaic and Classical eras are all anachronisms. This is interesting. I remember reading somewhere that crests were largely a ceremonial detail and were not usually worn in battle, although they are always shown on period artwork. (But then, the Napoleonic-era artwork often shows troops on battlefield wearing bright parade / formal uniforms even though in real life they would use less ornamental and much more practical field garb). As for Corinthian helmets being obsolete - didn't the story of Jason belong to the same time period ? This is interesting. I remember reading somewhere that crests were largely a ceremonial detail and were not usually worn in battle, although they are always shown on period artwork. You might be thinking of Imperial Romans. It is generally believed that they wore crests only on parade, but we don't really know for sure. Battle images from the Bronze Age and up through the Hellenistic era usually show crests, and Homer mentions them all the time. I'd say they were common. Battle was supposed to be showy! Since the whole point of crests was to be recognized and bigger and flashier, there'd be no point in removing them for battle. No, Jason and the Heroic era are Late Bronze Age, while Corinthian helmets are much later--Late Archaic and early Classical, well into the Iron Age. Mind you, the dates for the Bronze Age are generally inflated by a good 300 years, but even using the revised and reduced chronology it's too early for Corinthian helmets and all that other well-known Classical stuff. (But then, the Napoleonic-era artwork often shows troops on battlefield wearing bright parade / formal uniforms even though in real life they would use less ornamental and much more practical field garb). Er...they wore the drabber field uniforms on the march and in skirmishes, but we have records of Napoleon (and other contemporary commanders) oredring their troops to change into full parade gear just before engaging in a pitched battle. The troops apparently obeyed, since there are plenty of accounts about battlefield troops wearing items that don't exist except in parade gear! This is one of the movies in my sword DVD library and I am not all that impressed with it either but for the most part if it's a halfway decent sword movie, I've got it. Seems I just cannot get too much of swords and everything to do with them. I think the same is true in regard to other units. Yet, I am yet to find a single painting showing that. 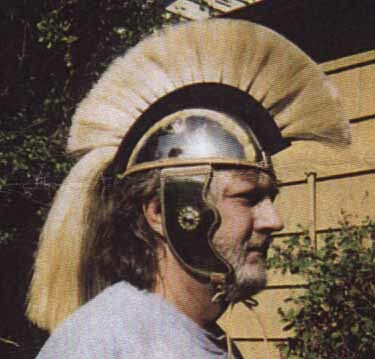 I also recall reading somewhere that majority of greek helmets uncovered from ancient battlefields did not have crests. I will try to find a reference to that. Yet, every single piece of Greek art that I've seen shows them. Now, I am not saying that the troops in Napoleonic wars didn't wear parade uniforms on the battlefield, or that Greeks didn't wear crests, merely that this was not the case as often as it was, and it's my (perhaps mistaken) opinion that you can't rely on the period artwork to be an accurate example of a typical contemporary warrior's outfit, as in some cultures and time periods artists seem to have a tendency to depict them wearing only the brightest and most "glorious" attire. I do agree that artwork is probably going to stress the showy stuff. And as we've been discussing above, Classical depictions of much earlier events and characters show Classical equipment with a few "old-fashioned" features now and then. So most of the vase paintings that show Achilles are no good for telling us what Achilles might really have worn. Well, we should also look for sources beyond historical artworks. I think I recall a Greek poet mentioning that the ideal of fighting was to get shield-to-shield and bow the head down so that the crest of the warrior's helmet is entangled with that of the enemy. Strictly speaking, though, the poet came from slightly before the Classical Age proper, so we don't know how well his poem would have applied to the hoplites' fighting techniques and tactics. The evidence for the Napoleonic period is less equivocal, since we have many examples of soldiers' diaries and memoirs mentioning that the enemy wore things like polished white gloves that would have been out of place in any condition of dress less formal than parade dress, whether half or full. Of course, this only happened in major pitched battles where at least one side had adequate time to change and it is certainly correct that soldiers largely wore drabber fatigues, surtouts, and the like on the march and when fighting in unexpected skirmishes.